Brian Terrill's 100 Film Favorites - #92: "Pirates of the Caribbean: Dead Man's Chest"
The Pirates of the Caribbean sequels tend to get a bum rap. While I agree that the third film kind of devolved into a confusing mess, I genuinely enjoyed the second chapter, Dead Man’s Chest. Introducing Davy Jones was a neat expansion to the world of the story, and he and his crew have a great, original look. After the release of Avatar, the news was full of articles about viewers sinking into depression because they could never really visit the planet Pandora. 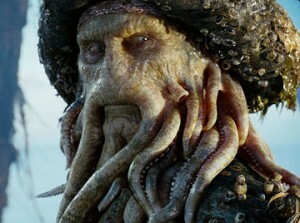 Well, the fact that I can never really grow an octopus beard puts me in a similar funk. It’s a No-Squid November every year. I felt the greatest strength of Dead Man’s Chest was its comical action sequences: Jack Sparrow fleeing a tribe of cannibals while still tied to a spit; The crew attempting to free themselves from spherical bone cages which come loose and send them tumbling down a hill; The climactic three-way duel between Jack, Will Turner, and Commodore Norrington on top of, inside, and all around a giant, spinning, wheel. These sequences all showcase innovative ways of getting from one place to another (which, if you really think about it, is what all action scenes are at their core). Additionally, the scenes are made more effective due to their reliance on actual props rather than solely on computer animation. The bone cages and most of the wheel scene were accomplished with physical props and setpieces, which adds considerably to the actors’ performances. It’s primarily due to the creativity and humor of these sequences that this film merits a spot on my list. Plus, Captain Jack continues to simply be a fun, funny character and it’s enjoyable to join him on another adventure. I actually felt the fourth film, On Stranger Tides, benefited from jettisoning some of the baggage of the previous sequels and just letting Jack do his wacky pirate schtick without the burden of an epic overhanging story arc. In my opinion, it’s the ponderous, unwieldy “epicness” of the story arc which most hinders the success of parts 2 & 3 of the Pirates saga. Dead Man’s Chest and At World’s End were shot back-to-back, an increasingly prevalent trend in modern movie-making. This model has some definite benefits: For one, all the actors are available for both films, and the same setpieces can be used in both. Unfortunately, the back-to-back sequel machine can lead to iffy results when motivated by the thought, “Hey, this film turned out to be really successful. Let’s make it a trilogy!” This method is problematic because the first “installment” is typically meant to be a standalone story, and trying to incorporate that standalone story as the “first part” of a trilogy often results in the second and third films dealing with and resolving themes and plot points which were never actually mentioned in the original film. One of the most noticeable examples of this is in the Back to the Future trilogy. The second and third films feature Marty’s hatred of being called “chicken” as a major plot point, though it’s a trait he never demonstrates in the first film. Dead Man’s Chest introduces several elements which are of great importance in both it and the subsequent film, despite never being addressed in The Curse of the Black Pearl. Davy Jones, the Kraken, and Lord Cutler Beckett are major parts of the “arc” which essentially come out of nowhere, yet we’re expected to care about them as much as anything introduced in the first chapter. This isn’t to say that introducing new things in later chapters to expand on the first film is bad. One of the elements introduced in Dead Man’s Chest which I actually liked a lot was the idea that Jack’s compass (described in the first film as simply not pointing north) is now revealed to point toward what its carrier most desires. The reason it normally just wobbles around wildly, you see, is because Jack doesn’t know what he wants. This is a clever way of building a minor element from the first film into something more significant. Really, I think the biggest shortcoming of Dead Man’s Chest is simply that it bleeds over into the third film. Dead Man’s Chest and At World’s End seem more like two halves of the same film than installments in a trilogy. I knew something was wrong when (Here there be SPOILERS) Captain Barbossa appears at the end of the film, resurrected in a cliffhanger ending. I had sincerely hoped the second and third Pirates films would feature relatively self-enclosed stories. There could be character development, but each film would focus on a different aspect of sea mythology and feature a different antagonist. 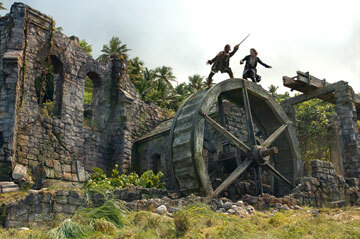 That’s how Indiana Jones and James Bond do it, so why not Jack Sparrow? I was relieved when On Stranger Tides took this tack (though they may have gone a bit too far when they lifted Blackbeard’s “he chose poorly” death scene straight from Indiana Jones and the Last Crusade). Ultimately, Dead Man’s Chest is a colorful action-adventure-fantasy-comedy. By necessity, trying to please everyone with all those different facets results in an imperfect final product. But nothing’s perfect. There’s a lot of fun to be had in this movie. It’s hard to go wrong with sand, surf, and sea monsters. The film abounds with great music, good acting, and innovative and funny action sequences. If you can overlook the ending that bleeds over into a messy third act, Captain Jack’s second outing is a voyage worth taking.